AVENGERS INFINITE SERIES. MANUFACTURED: 2014 Hasbro. MARVEL'S DEATH'S HEAD. SERIAL NUMBERED: None. The back card is correct, no error. I will try to make it right for you. Hasbro 2011 - Marvel Legends - Terrax wave - Terrax BAF Head Axe parts. Deaths Head "Wave 2". I will do the rest for you. This is very important! General Information. Trending at C $24.62eBay determines this price through a machine-learned model of the product's sale prices within the last 90 days. The beloved, powerful Marvel Super Heros make a compelling display, too! Need to stay healthy this year?. You can find Slim Fast, McCormick Seasonings and more. 18 plus points of articulation for dynamic play and posing. A great addition to any collection or for play! Odin/ All Father/ King Thor Head, Axe, and Red Cape BAF Pieces (From Captain Marvel). King Thor Head BAF Piece. Red Cape BAF Piece. Trending at C $27.64eBay determines this price through a machine-learned model of the product's sale prices within the last 90 days. See pictures for details and condition, sold as is normal shelf wear. Check out our YouTube channel. Baron Zemo. 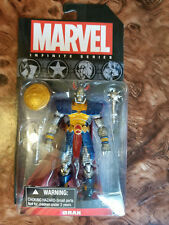 It is part of the Marvel Legends Mojo Series. NEW W/ Box Damage Marvel Legends Baron Zemo Masked Variant Mojo BAF. Condition is New, sealed with some box damage see pictures. Otherwise the deal will be canceled and the item will be relisted. If your request is reasonable, rest assured, I will do my very best to fix any issue. As always, you get EXACTLY what is pictured. Level up your collection with Kratos. Your favorite God of War character, Kratos, gets the Pop! Perfect for play or to collect. Kratos will make the perfect newest addition to your Pop! Vinyl Collection!